I am fortunate to have a large family and every year we take turns hosting major holidays like Thanksgiving and Christmas. Not only does this mean cooking a turkey with all the trimmings, it also means making the house presentable! And that means using up precious time that could be spent quilting! Lucky for me, this year was not my turn! So I had lots of time this weekend to finish the last block of Sue Garman’s “Bouquets For a New Day. I glued the stars and circles on the basket. …and finally, a bow! All 12 blocks are Officially Finished! The ribbon ends have very deep inner curves, which can be a little intimidating. First of all, I make 3 cuts at the base of the curve. The first one is at the centre of the curve and about 1\8″ away from the freezer paper. The 2nd and 3rd cuts are on either side of the first cut. Anytime I clip a curve, my scissors are always perpendicular to the freezer paper. Using a stiletto and mini-iron, I fold the seam allowance over the freezer paper, just until I get to the first clip. Then I put the stiletto down, and fold the freezer paper towards myself so I can use the very tip of the iron to get into the curve. Next, I return the freezer paper to its original position and continue folding the seam allowance over. There will be very little seam allowance around the curve. Don’t panic. Once the complete shape is prepared, I put a dab of Roxanne’s Glue at the base of the curve just to give it a bit of stability. Once the glue dries, I remove the freezer paper template. Since I wasn’t cooking a turkey, I took the time to stitch the blocks together and add the 1″ inner border. So far, so good! Kerry! It is looking beautiful! Love this quilt. You are working very fast! You will be done before you know it. Will you hand quilt this one? Hi Missy: Thanks! I will be hand-quilting this one for sure. It will be a good winter project! Thanks, Audrey. This was such a huge project. I am so glad it is done…now on to the hand-quilting! not only was your tip for doing deep inner curves perfect, but the blocks look spectacular! Makes me want to run to the book shelf and pull out the binder with my patterns for this project. So much temptation!! It’s such a good project. A little challenging, but very do-able. 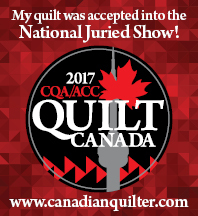 If you are using the pattern that was downloaded from “The Quilt Show”, there is an error in the first beige inner border. Not sure if it was corrected in the pattern that could be purchased from Quakertown Quilts. Thanks! Glad it’s finally done!